Next month, April, has one day that sets it apart: Earth Day. Remember, most of our planet called “Earth” is covered in water. In fact, “Water” might have been a better name for the planet we live on. As divers, we get to explore the rest of the planet that few will ever have the chance to see. We are on the front line of conservation because we know what goes on under the waves and we can be the voice of the ocean. 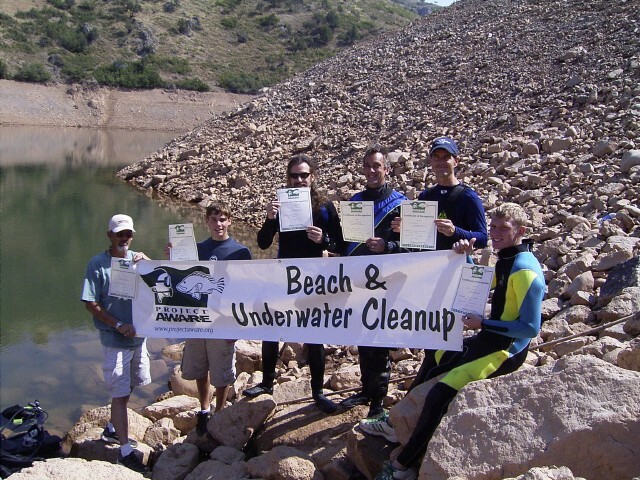 Divers at a beach and underwater cleanup. Earth Day is a great time to get involved! The Project AWARE Foundation is a non-profit organization that specializes in education and conservation of our aquatic world. Their two primary goals are protection of sharks, a heavily threatened species, and marine debris. Project AWARE was started by PADI in the late ’80s. Since then, it has grown and changed. PADI supports Project AWARE in a variety of ways, one is the various diving specialty courses to help you learn more about the aquatic world and how to protect it. The first Earth Day was April 22, 1970. People concerned with the health of our planet spoke out on protecting the planet we live on. Earth Day for divers probably means more because we see more of the planet than non-divers. Divers are the natural ambassadors and advocates for the aquatic world. Threats to aquatic ecosystems aren’t limited to the oceans. For example, in 2010 there was an oil pipeline leak in Red Butte Canyon near Salt Lake City. That leak contaminated a creek and spread the spill over many miles before being caught and somewhat contained in a lake located at a park. Another example is what happens when an invasive species gets into an aquatic ecosystem. Lionfish have become the scourge of the Caribbean. Zebra mussels have invaded many lakes. In one of Utah’s hot springs, someone introduced tilapia. This fish has decimated the underwater vegetation and started to threaten the lake’s ecosystem. This lake is also one of the popular dive sites in Utah and divers have noted a distinct problem with visibility due to the lack of vegetation. Protecting our aquatic resources is important to all of us. Much of the oxygen we need to survive is produced by phytoplankton in the oceans. We need oxygen to live. If the oceans die, our source of oxygen dies and we’ll go with it. It’s not all gloom & doom, though. Some great strides have been made for conservation. There is much to do and we’re able to make a difference. Stay tuned for more information on how you can learn more and how you can personally make a difference.